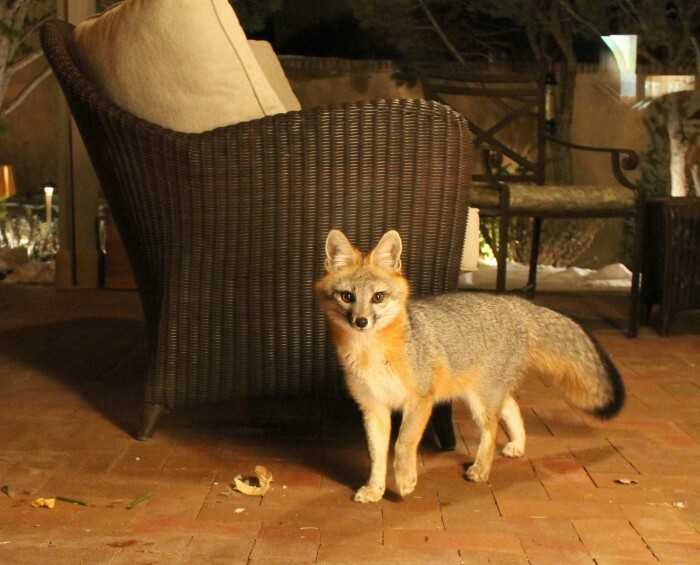 Gray fox visits a Santa Fe patio in December. Photo courtesy Outspire guest Angela Fletcher. You steal mine, I’ll borrow yours. Although many fewer in number and more seldom seen than their larger cousin the coyote, clever foxes of several species inhabit the Santa Fe area. All are carnivores, at least in part, and all are most likely to be seen at night when they are most active. Fox paws have non-retractable toenails like a domestic dog but unlike good-ol’ Rover, his wild cousins are not couch potatoes–toenails are usually well worn and may not show up readily in tracks. And unless the footing is poor (like deep snow), local wild canines “single track” by placing the hind foot in the track of the opposite front paw. This leaves a trail in a single line like a cat rather than a wide-bodied Labrador Retriever. Gray foxes (Urocyon cinereoargenteus) are more numerous than one might suspect. They may be distinguished from coyotes not only by their smaller size (5-12 pounds), but by a distinct black stripe down the top of the tail. They are quiet, nocturnal and solitary for most of the year. They are not in fact “true” foxes at all but thought to represent a more primitive canid, closer in trait to the time when canines and felines diverged. They are the only canine that routinely climbs trees using its recurved front claws, a useful skill in hunting or escaping other predators. Climbing a tree to gain access to an otherwise enclosed patio is no trouble at all! Gray foxes have been known to occasionally den in trees, or have a relaxing nap in hawk or squirrel nests. Red fox (Vulpes vulpes) are a “true” fox quite distinct from Gray fox, although approximately the same size. They are quite uncommon in New Mexico though regularly reported in the Sangre de Cristo and Jemez Mountains. They are typically a beautiful rusty-red with black legs and bushy white-tipped tail, but dark (melanistic) variations are seen. Dark (sometimes called “cross”) foxes can easily be distinguished from Gray foxes by the white-tipped tail. 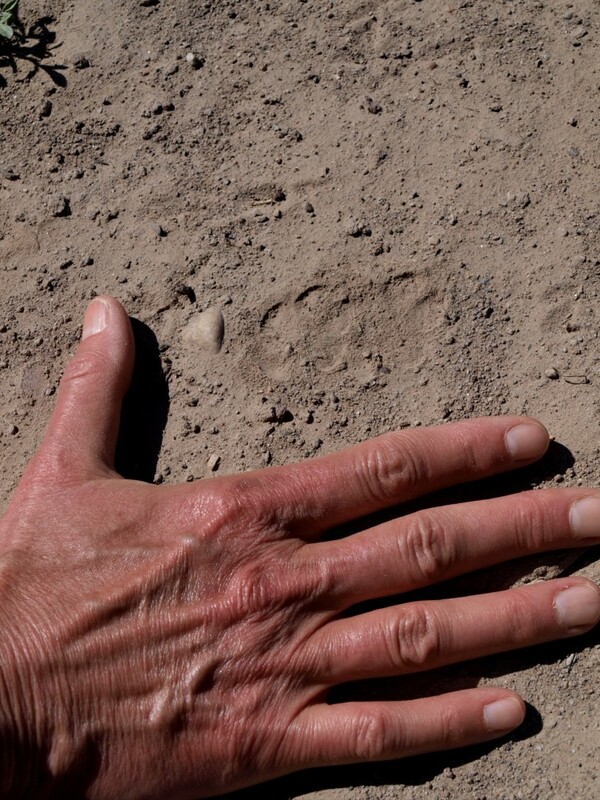 Tiny track of a Kit fox in dust. Although it’s unlikely you’ll see one of our foxes out during hiking, keep an eye peeled for signs of their visits. This entry was posted in Critters, Flowers&Fauna and tagged fox, hiking, New Mexico, Santa Fe, wildlife. Bookmark the permalink. I love the little fox on the patio. For a moment, I thought it was a per. So small! The Gray fox on the patio is not quite twice the size of Kit fox–Kits are tiny! My husband saw a pair of Kit foxes near Bicentennial Park last year while he jogged very early one morning. He wasn’t completely sure what he’d seen and first mistook them for cats!